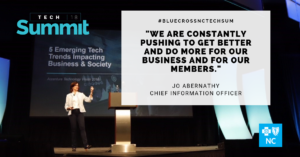 The NC Technology Association (NC Tech) sat down with our own Chief Information Officer Jo Abernathy, who recently joined NC Tech’s Board of Advisors. As CIO, Jo is responsible for our technology strategy and operations. But that’s not all she’s passionate about. Jo’s a champion for employee engagement and women in STEM. Get to know our leader a little more in this Q&A that originally appeared on NC Tech’s blog. There was no single person or incident. I stumbled into IT completely by accident early in my career. In fact, I took only one Computer Science course in college, and I found it to be very difficult. It was conducted in a huge lecture hall, and the professor literally seemed to be speaking a foreign language. I struggled to get through the material and the labs. Several years later, I realized that the subject matter wasn’t hard and was actually quite fun and interesting and that he was absolutely a terrible teacher! That intimidating experience could have been an inspirational one with a different approach by the instructor. What was your experience like as a working mom when your child was younger? Regarding being a working mom/parent, I am certainly not unique in any way! I experienced the typical exhaustion and huge guilt for missing out on school and extracurricular events, and guilt over breaking promises because something urgent came up at work. When my son was a toddler, I remember several occasions when my husband was out of town and a serious problem came up at work in the middle of the night. I had a great boss, Tammy Neef, and she came into the office and watched my son Sam while I worked the problem with my team. 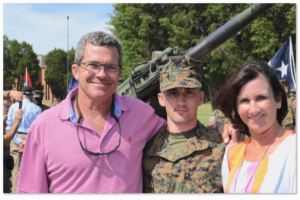 Jo and her family at the Marine Corps Base in Quantico, Virginia at her son’s graduation ceremony for Officer Candidate School. Her son, Sam, is a senior at The Citadel. He will commission as a Second Lieutenant when he graduates this spring and head to the Marine Corps full time. I also remember the time when I drove like a maniac to get to Sam’s preschool for a little birthday party they were having for him, and when I arrived – about 20 minutes late – they were all seated at the table waiting, and Sam burst into tears when he saw me. I’m pretty sure he wasn’t sure if I would show. I also remember funny times, like trying to make some boxed food product look homemade at 1 a.m. for some school event the next day, with lots of wisecracks from my husband. If there is an upside to working long hours, my son learned to be very self-sufficient at an early age! I think it’s a little easier today, as companies are much more understanding with flexible work hours and supportive of work/life balance attempts. And most of the “on call” duties can now be handled remotely from home, which is a huge benefit. Even so, when I log on late in the evening, I often get IMs from my team members with young kids, and I know they are on 3rd shift and very tired! As we all know, studies have shown that many girls and young women tend to shy away from tech fields without some encouragement. Thankfully, there are more role models and more support organizations than ever before available to girls wanting to explore careers in STEM (Science/Technology/Engineering/Math). So we’re seeing a slow increase in women entering technology fields, which is good. And I believe that this problem will be a thing of the past before too long, given the comfort that most all young children have with technology today. However, I do see that keeping women in technology careers can still be challenging. If women have children, a career in technology can often be too overwhelming to handle both work and family. I know this is true of other professions as well, but technology careers are particularly challenging in terms of the need to be available on a 24×7 basis and the need to respond to the many pressures and deadlines associated with technology implementations. This will sound like a self-serving comment for “my people,” but tech folks can attest to the fact that the complexity and challenges of what we do are often underestimated. On top of that, technology is changing so rapidly that it is difficult to keep one’s skills current. So it’s not the kind of job you can leave at the office at the end of the day. This presents tremendous pressures for mothers in particular. I know it challenges fathers as well, but culturally, mothers are still doing much of the heavy lifting at home when it comes to young children. I see women dropping out of tech careers mid-career as the pressures get to be too much. I once worked with a woman who remarked that she worked harder than other women because she did not have children. It was all I could do not to laugh. But I decided to say nothing and let her enjoy that fantasy. This is a tricky problem to solve because the pool of job candidates has to increase in order to increase the number of women employees in IT. That pool is still not growing fast enough. This is especially true at senior levels where it is very difficult to find female candidates. I think companies will have to continue to seek out and compete for female IT talent, but they will also have to find ways to grow it internally. I realize that is profoundly obvious advice, but there is no silver bullet to solving this challenge. I think my greatest accomplishment is being resilient; owning failures, continuing to learn, and pressing on to face the next set of challenges. That sounds quite simple but in reality, it can be very hard sometimes. I really do believe there are a few traits one can’t have too much common sense, a strong work ethic, good manners, and resilience. Like many companies, we’ve deliberately tried to recruit for women in IT and develop our female tech talent. 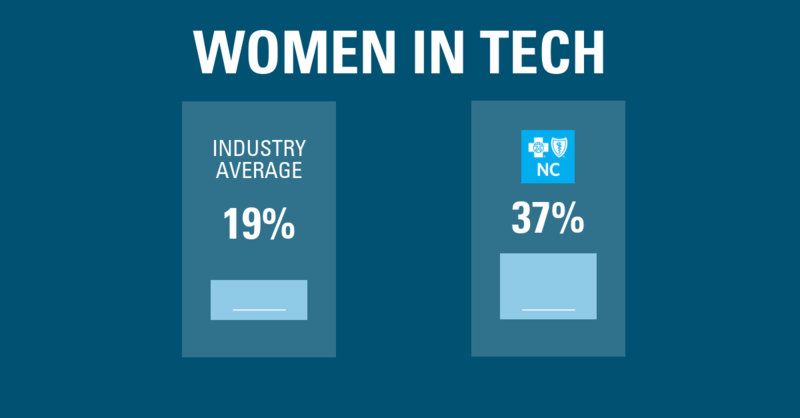 Over 37% of the workforce in IT at Blue Cross NC is female, and that’s a pretty good stat considering the national average is 19%. That said, we still struggle like most companies to grow that number. 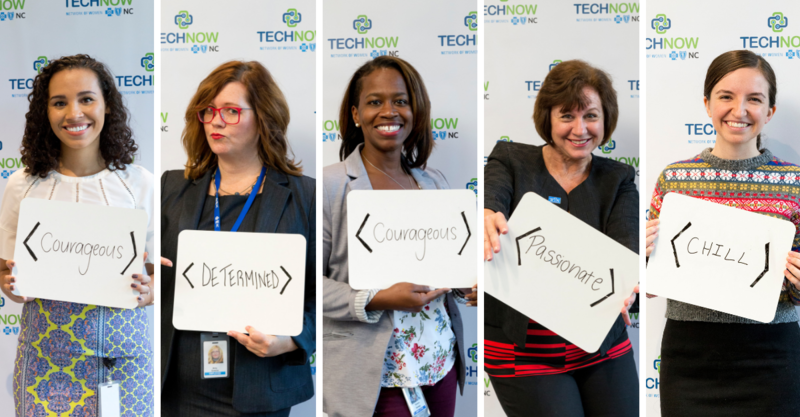 Blue Cross NC employees at the Women in Tech Forum, Tech NOW’s launch event. 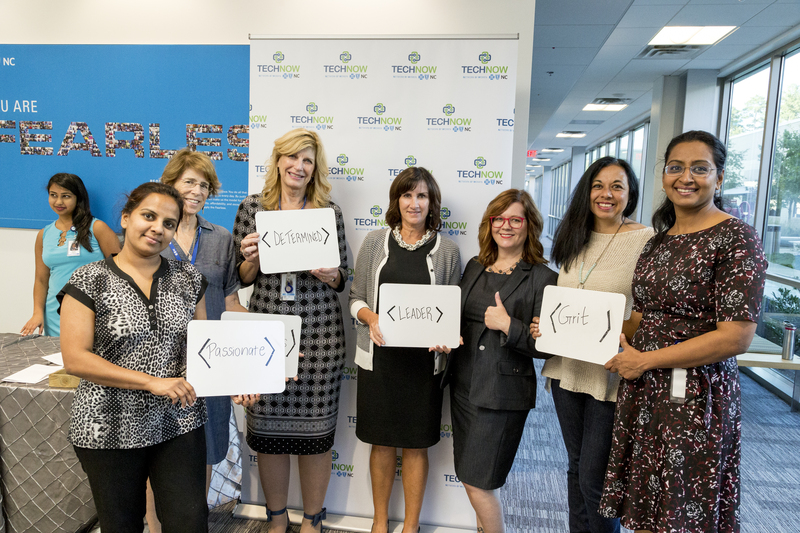 Amy Greene, a very creative person in our IT shop, came to me earlier this year with an idea to start a networking group for women in tech at Blue Cross NC. That was a big duh moment, and I was embarrassed that we had not done it earlier. So we started Tech NOW (Network of Women) as a means to offer skills building, professional development, networking and support for women in STEM roles or those interested in STEM roles. Our first big event was held in the fall and a few of my rock star women tech leader pals participated: Dede Ramoneda of First Citizens Bank, Laurie Schaefer of IBM, and Trish Halley of SAS. It was a lot of fun and hopefully inspirational to the large group of attendees. Also, Fara Palumbo, our Chief People Officer, had an idea about leveraging Momentum, a firm in downtown Durham specializing in an immersive program to train people to code, as a way to grow IT talent. We selected three individuals from our Customer Service area (two of them happen to be female) and put them through the 12-week program. They did well in the training and moved over to our technology team in November. We’re excited about it, and while we’re still in early days, I suspect we will continue to leverage this approach to grow our in house talent. I think it would be Ginni Rometty of IBM, especially if I could get the inside scoop on the Red Hat deal! She’s amazingly talented, and I’m sure I could not last a week in her job. But, um, respectfully, I would definitely lose the headband. The supply of tech talent isn’t growing to keep up with demand. Additionally, the baby boomers will exit the workplace, leaving large gaps. Having women in tech is just one aspect of a diverse workforce that is needed to get the best products and performance from companies in today’s economy for today’s consumers. I’ve mentioned the important items on our brag sheet above – we have a high percentage of women professionals in IT relative to the national average; we’ve started a successful support community to help cultivate and support women in IT; and, we’ve tried a creative approach to grow our own talent internally. 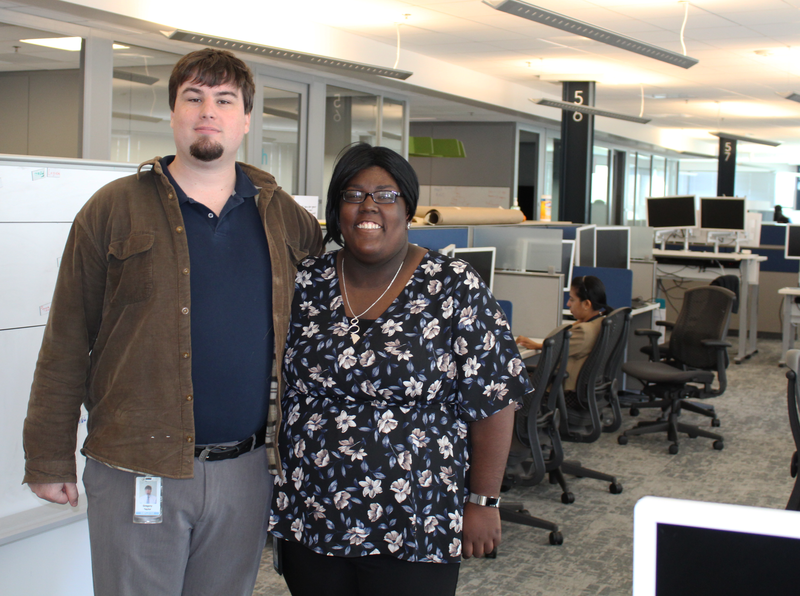 Additionally, we made ComputerWorld’s “Top Places to Work in IT” list in 2016 and 2018. This is especially meaningful to me as it is largely based on the feedback from our employees in IT, including aspects of our culture and environment such as diversity and inclusiveness. BONUS QUESTION: What books are currently on your nightstand/in your Kindle library that you recommend to women as a must-read? “Execution: The Discipline of Getting Things Done” by Larry Bossidy and Ram Charan is an oldie but a goodie in terms of business books. I could not agree more with the authors that the ability to execute is the single most overlooked skill in business and often dismissed (quite incorrectly!) as mere tactical stuff that anyone can do. And while I generally don’t like books that are geared toward women and make gross generalizations about women in business, someone recently gave me a copy of “How Women Rise” by Sally Helgesen and Marshall Goldsmith and I found it to be a good read. The book has insightful tips about owning habits and blind spots that can get in the way of one’s best performance. It does generalize for sure, but it also makes you think. The post Our CIO on her dream job, women in tech, and what’s on her nightstand appeared first on Point of Blue.